Lonnie Zamora's account Of a Close Encounter in New Mexico received considerable coverage in the mass media, and is sometimes regarded as one of the best documented, yet most perplexing UFO reports. Of importance here is that symbol(s) was or were obvious on the side of the vehicle. From Project Blue Book. Project Blue Book makes an absurd attempt to say the glyph Lonny Zamora witnessed on the craft of unknown origin was the intials CIA. The experience of Lonnie Zamora on April 24, 1964 stands as one of the most profound ufo events in the modern history of the phenomena. Lonnie Zamora saw a highly unusual device of unknown origin, what can only be described as a "craft" of some kind, and he reported seeing what he believes were occupants. The experience of Lonnie Zamora on April 24, 1964 stands as one of the most profound ufo events in the modern history of the phenomena. To this day it remains a case in which all the facts involved support the witnesses claims and it is this kind of case that makes the ufo phenomenon such an enduring mystery. Lonnie Zamora saw a highly unusual device of unknown origin, what can only be described as a "craft" of some kind, and he reported seeing what he believes were occupants. Despite the controversy which often surrounds the subject of UFOs, the incident at Socorro remains an example of what the UFO phenomenon is, in fact, all about. The following information is based on facts I have gathered from various sources including conversations in person and by telephone with Mr. Lonnie Zamora. This is not intended to be a complete report on Lonnie Zamora's experience, but is intended to provide a source for some resh details about the case and to clarify others. More than anything else I have made every effort to ensure that what is here is the truth. I also owe a great deal of gratitude to Mr. Ray Stanford, one of the most thorough and knowledgable investigators I have met. He arrived in Socorro within four days of the incident and authored the definitive book on Zamora's experience and the subsequent investigation. I recommend it to anyone seriously interested in this case and in the subject of UFO's in general. "Socorro Saucer" in a Pentagon Pantry" is available in major libraries but can be obtained from the author. Check HERE for the address. Socorro is a small town located about an hours drive south of Albuquerque, New Mexico . In April 1964, Lonnie Zamora was a police officer with the town and late in the afternoon on April, 24th he had just dropped his pursuit of a speeding car to go check on what he thought might have been an explosion on the outskirts of town. Thinking that a small shack containing dynamite might have exploded, he made his way up a rough embankment and then moved slowly along a narrow gravel road that wound beside a small arroyo (a shallow dry gully). From this first more distant vantage point he saw what he thought might have been an overturned car down in the arroyo and radioed back to his headquarters that he was proceeding to check out this 'vehicle'. It was from here that he saw what he described as possibly two children or small adults, and he noted that one appeared startled at his approach and seemed to "jump somewhat". He moved further along the gravel road and finally stopped his car at the point where he believed he had previously seen the vehicle in the arroyo. It was at this point that he heard what he later could describe as several loud "thumps" or "slams", similar to metal hitting metal. As he left his patrol car and proceeded towards the gulley, he had not gone more than a few steps before he had a full view of an elongated oval shaped object on "girder-like" legs. In that instant a loud roar and bluish flame shot out of the underside of the object and it began to rise. Zamora did not hesitate...he hit the ground thinking it was about to explode, then got up running and jumped down on the other side of the gravel road. He heard a whirring noise and watched the object rise up out of the arroyo, the legs he saw moments before were no longer apparent. He noted that the object had risen to perhaps 20 feet above the bottom of the gulley when suddenly the sound stopped completely. There was no more flame visible and he watched as the now-silent vehicle moved off parallel to the terrain picking up speed as it left the area. He watched it move off into the distance and it eventually disappeared from view. Almost immediately upon the object having left the area, State Police Sargeant Sam Chavez arrived having overheard Zamora who had radioed wildly to his dispatcher hoping that someone else might be able to see the object. Together they noted the evidence left in the arroyo...a half burned bush, four angular impressions in the sandy soil where the "legs" had been, and several small footprints and other impressions. From an oil painting based on photographs taken of the actual landing site. The image portrays the object just as it began to lift off and from a viewpoint near where Mr. Zamora reportedly stood. Mr. Zamora has seen this illustration and stated that it is a good representation of what he observed, though he felt that the "legs" might have been extended slightly further than is portrayed. The dimensions presented however are taken from both the witnesses description and the exact measurements provided by investigators of the impressions in the soil. Ever since the first report that Zamora had seen some type of symbol on the side of the craft there had been some confusion about just what that symbol was. He had drawn and described this symbol to several people soon after the incident, and what appeared to be discrepancies in the description had arisen from various sources. There does appear to be some support for believing that the symbol that was widely circulated early on may have actually been a variation of the actual one. The idea that a substitute might have been circulated by the investigative personnel from the Air Force or other governmental agencies as a way to guard against copycat reports has some merit. Though the actual shape may not be ultimately important to the overall case I did make an effort to try to obtain an honest description of just what Zamora saw. In one of our telephone conversations he clarified to me that he had never been told -not- to relate the actual shape and he gave me a description which I realized was slightly different from what I had heard and seen before. I was curious about this and shortly afterward I sent him several pages of small sketches which covered various details of his sighting. I included several variations of this symbol including one that matched what I had seen in other places and one that matched what I thought he had described to me. I asked him to merely place a check mark by whichever sketch matched his recollection. Below are several sections of the sheets I sent him, and his check marks are visible. 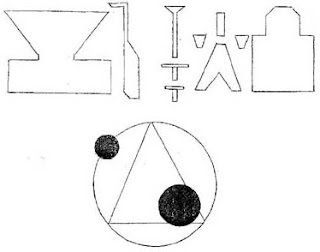 But on the section showing the symbols, he was nice enough to actually redraw what he had seen. Of all the evidence that could be presented to support the contention that what Lonnie Zamora saw was something totally unexplained, perhaps nothing is more compelling than this brief article. It appeared in the formerly classified CIA publication entitled "Studies in Intelligence" from the fall of 1966. It was written by Hector Quintanilla, Jr., the former head of the Air Force's Project Bluebook. "There is no doubt that Lonnie Zamora saw an object which left quite an impression on him. There is also no question about Zamora"s reliability. He is a serious police officer, a pillar of his church, and a man well versed in recognizing airborne vehicles in his area. He is puzzled by what he saw, and frankly, so are we. This is the best-documented case on record, and still we have been unable, in spite of thorough investigation, to find the vehicle or other stimulus that scared Zamora to the point of panic." This document was approved for release on January, 2, 1981 and is available to anyone under the provisions of the Freedom of Information Act. It is my hope that this information is useful to anyone wanting to know more about the subject of unidentified flying objects. Even I find it easy to become disillusioned at times when I find that almost all the readily available information is made up of fantastic claims made by people who offer no valid proof. However, anyone who looks closely will be able to find that there are many cases, like the Socorro incident, that clearly indicate something physically real, and of a high degree of strangeness, is being seen by honest, reliable witnesses. The initial investigation. Left to right: Sgt. Lonnie Zamora, Mr. Burns (FBI), Maj. H. Mitchell (AFMDC), Coral Lorenzen of APRO, and Sgt. Castle of the Military Police. Photograph of one of the landing marks left by the object. Rocks are piled around the imprint to preserve it. 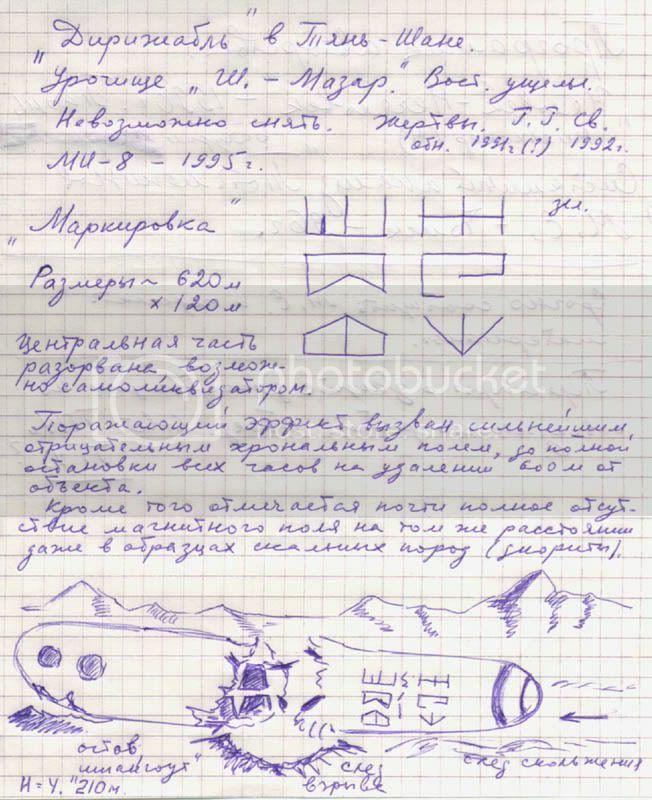 "As the story goes, a huge dirigible-shaped object first attracted attention on August 28, 1991 at 4:42 local time when it appeared on the radar screens of the Mangishlak Peninsula, flying from west to east at 960 km per hour and at an altitude of 6600 meters. The object would not respond to communications, and fighter jets were sent to intercept it. The pilots intercepted it over the Arial Sea, and described it as dirigible-shaped, 600 meters long and 110 meters wide, with very little surface detail except for two round "holes" near the front. The object did not react in any way to the presence of the jets. When approached, however, the MIG's systems shut down and engines began to malfunction. The object began to make zigzag evasive maneuvers and increased its speed from 960 km/h to 6800 km/h. About half an hour later, the object disappeared from the radar, in the area of Lake Issyk-Kul near the border of Krygyzstan and Kazakhstan. The next major development occured a month later, when reports began to trickle back that a huge UFO had been seen to crash in the Tien-Shan mountains. The site was said to be in a gorge named "Shaitan Mazar" or "Grave of the Devil". A search party dispatched failed to reach it due to heavy snowfall. An Air Force helicopter sent there also failed, as it had crashed. In June of 1992, a second expedition was mounted, which arrived on-site on 6/12/92 and set up a base camp 2.5 kilometers NNW from the actual crash site. The path of the object was noted to be such that it had slid 1700 meters after hitting the ground. It then exploded from within its center, blasting it into almost two equal parts and bending its internal structure outwards from the center of the explosion. Decks and interior features were visible inside the object through the gap made by the blast. They could not photograph the object because some sort of radiation exposed all film and ruined all videotape. Whenever a member of the party got closer than 800 meters to the object, he began to feel unusual anxiety, depression, and exhaustion. Within this 800 meter range, the men's hair stood on end. Instruments showed an unusually high amount of static electricity in the area. Compasses and magnetometers refused to function properly in the area of the object. Measurement devices registered no magnetic fields at all within an elliptically-shaped area centered on the object and measuring 2230 meters long and 1700 meters wide. Even naturally occurring magnetic rocks showed no magnetic field within this ellipse. All clocks and wristwatches stopped at a distance of 600 meters from the object. Anyone who approached the object began to suffer from some sort of radiation burns at a distance of 500 meters. 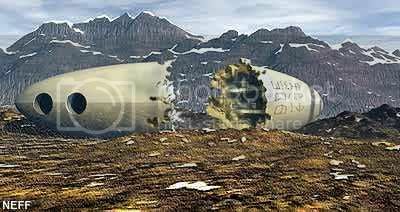 "The object had been moving at a large speed and was hit on the bottom part of its fuselage by a rocky ledge at 1700 m from the present site site. Then it slid on a quite flat, almost horizontal platform which still is covered with strong rocks. The craft exploded into two almost equal parts mostlikely after its stop or, in its moment of grounding. The explosion occurred inside a central part of the vessel; the character of damage showed that. The hull plating and longitudinal carrying details of frames of craft are literally turned out, between pieces of the craft a funnel is distinctly visible, and on its edges the quite large pieces of rocky breeds are thrown out, as indicating the explosion of an"overhead" charge. Dints and cracks on body in the fore part of the ship resulted on impact with outstanding almost 20 m a flat platform of pyroxenit above, in which a round deepening is now seen of width more than 20 m and height at centre of 4.5 m. Behind this point (20 m to east) the pathway of a sliding track begins of width more than 40 m on the rocky surface. The cracks on the left side of stern fuselage part, located vertically at height approximately 1/3 heights of the ship's body, are possible to have happened on impact (hitting a rock), but it is possible, that they could be formed and by the explosion of the craft. But most strange are the symbols of green colour located on a tail part of the object, and the rings of dark colour, surrounding a stern. Possibly the rings are a part of the engine. Decks and bearing structures are distinctly visible inside the craft. Whether the landing like an aircraft was planned by a crew, or was it by some program on board a navigator computer? This question may be mystery forever." USA Kecksburg Dec 9 1965 an Object crashed in the woods of Kecksburg, PA and was removed by the military on a flatbed truck. Witnesses reported an acorn shaped object that had strange symbols on the outside of the craft. Here is the original PA Tribune-Review Article and sketch from 1965. A well recorded and little known event in the Western world would be the events of the Utsuro Bune. 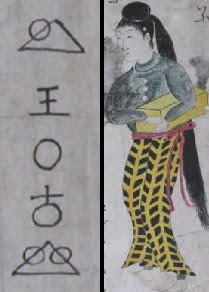 This is a myth dating from circa 1800 Japan. It states that a USO ( unidentified submerged object) washed up on the shore. The inhabitants of the village witnessed the object on the shore stating that is was spherical with strange writing on it. Out of the capsule came a woman dressed in fine clothing. She spoke a different language and was not able to communicate with the locals. The Rendlesham forest story involves an American Air Force base in England. As I understand the story a UFO began shining a light beam ( as if to scan for something) across several portions of the base. The executive officer at the time a Lt. Colonel Halt led a team into the woods to chase after the craft. Apparently one of them got close enough to record symbols on the craft. Here I would like to show the similarities between these two writings, despite the time difference of 200 years.It seems rather odd that there would be any similarties between these two. However, it can be seen that the commonality is the triangle with 2 circles. The differences being that the midpoints of the circles are lined up with the midpoints of the triangles in the Utsuro bune while in the Rendlesham the triangle is inscribed within a circle. The midpoints of the two circles seem to be in line with the centroid of the triangle. I merely wish to present this curiosity and I have no intention of offering an explanation for it. Perhaps in the future there will be a greater connection. .In a book repository in Japan, there’s a document dating back to the 1800s called “Tales of Castaways.” In it, there’s a strange story about usturso bune, or “hollow ship.” It describes an incident in which a 3 meter by 5 meter round, metal ship with crystal windows washed up onto a Japanese beach in modern day Ibaraki prefecture. Inside the ship was writing in a language the Japanese had never seen before. What was so important about the box, though? What was in it? Some people say that it had the head of her lover in it, and the reason she was in this UFO-boat in the first place is because of some scandal in her home-country (one person says China). The box, however, “wasn’t the type of box traditionally used for severed heads.” I don’t know what kind of box you’re supposed to use (no experience in heads myself… boxes for severed arms and legs is another thing, though) but the stories about the severed head came well after the original documents, and seem to be speculation. Seriously. OPEN THE BOX. UFO Encounter Or Made Up Story? The design of the ship is really similar to other descriptions of UFOs, and it happened in Japan in the 1800s – a time before modern UFO stories and a place not known for its UFO sightings. But a lot of people doubt the credibility of these stories. The tale of utsuro bune comes from a collection of fishermen stories. Fishermen have been known to exaggerate their stories, like the size of their catch, so who knows if “Tales of Castaways” is accurate. On the other hand, UFO enthusiasts might tell you that this particular story is plausible. The Bermuda Triangle’s sister, the Dragon’s Triangle (also known as the Devil’s Triangle), is a “danger zone” in the sea off the Southern coast of Japan. A large amount of boats have gone missing there along with 800+ people, never to be seen again. Some people believe that both the Bermuda and Dragon’s Triangle are actually where aliens have set up underwater bases (because it’s tough for us to find them there). Boats that make their way into alien territory aren’t guaranteed to make it through. Some would say that the Utsuro bune came from this “Dragon’s Triangle.” Who really knows, though? In Hokota City, Ibaraki Prefecture you can visit a park that “commemorates” the whole Utsuro bune thing. There’s an artist’s rendering of the UFO and you can go inside and check it out.